The earth sure is an active celestial body, isn't it. There are several volcanoes erupting now, major storms affecting millions, air travel has come to a near-standstill and now a pretty big (for us in GA) quake. The earthquake happened last night at 10:23 pm. I had closed down my computer and was doing the going-to-bed routine. I had just turned off the light in the living room on my way to the bedroom, and I felt a shaking. The air conditioner began to rattle in the window, the metal clanking against the sill. Outside no trucks were going by. The rattling continued for some seconds, and I said to the cats, "Boys, we are having an earthquake." Then the neighbor's dog began barking (who only barks when his mommy comes home) and I knew for sure. Quake. A few minutes later we received a robo-call from Emergency Management, stating that a quake had occurred in SC, that Madison County residents had felt it, and please don't call 911. The quake, a 4.4, downgraded to a 4.1, occurred in Edgefield SC, near the border of GA. The epicenter was 88 miles from were I live. "COLUMBIA, S.C. (AP) - The snow and ice dumped by an unusually severe winter storm were melting, once-frigid temperatures were rising and residents of South Carolina and Georgia finally had begun to relax. Then the earth shuddered. A small earthquake shook both states late Friday, shaking homes and rattling residents hundreds of miles away. The quake happened at 10:23 p.m. and had a preliminary magnitude of 4.1, according to the U.S. Geological Survey's website. It was centered 7 miles west of the town of Edgefield, S.C. , and was felt as far west as Atlanta and as far north as Hickory, N.C., each about 150 miles away. "It's a large quake for that area," said USGS geophysicist Dale Grant. "It was felt all over the place."" SC is a seismic area, though it seemed to have been sleeping prior to 1886, when a 7.3 quake struck. Wikipedia says that very little to no historical earthquake activity occurred in the Charleston area prior to the 1886 event, which is unusual for any seismic area. A factoid about the SC quake last night from USGS: There were 11,743 responses in 880 zip codes in 53 cities. USGS explains of earthquakes in the Inland Carolinas Region, that the largest earthquake in the area (magnitude 5.1) occurred in 1916. Moderately damaging earthquakes strike the inland Carolinas every few decades, and smaller earthquakes are felt about once each year or two. It's been interesting to watch some earth happenings this last week. 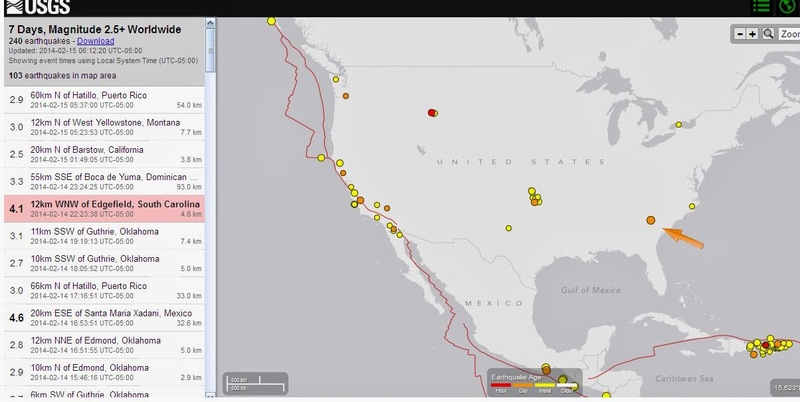 This quake in SC is not the only interesting earth or seismic event happening. 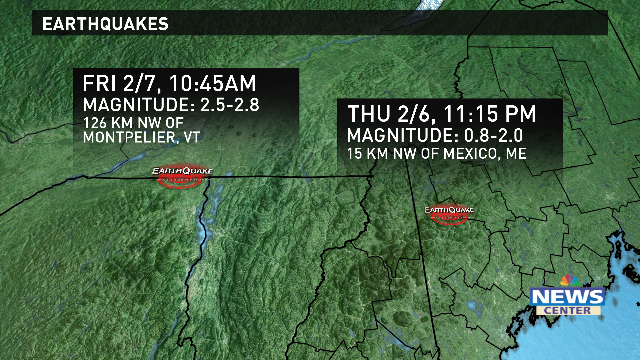 There was a quake in Massachusetts a few days ago, too. Actually, a pair of them, which is unusual. 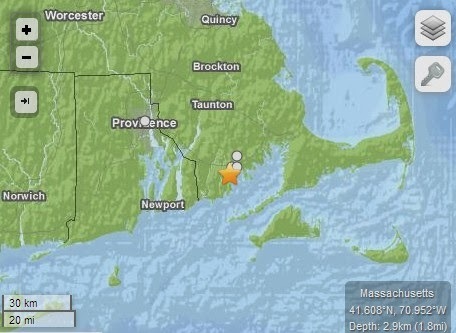 For the second time in just over a month, SouthCoast felt the earth move. According to the U.S. Geological Survey, the 2.4 magnitude earthquake was centered about 1.8 miles below ground in Dartmouth's Bliss Corner area in South Dartmouth. There were no immediate reports of damage from the temblor which hit at 5:46 p.m. Tuesday. But the quake was felt across much of the region with many people taking to social media to share their stories and a number of police departments reporting a flood of calls. 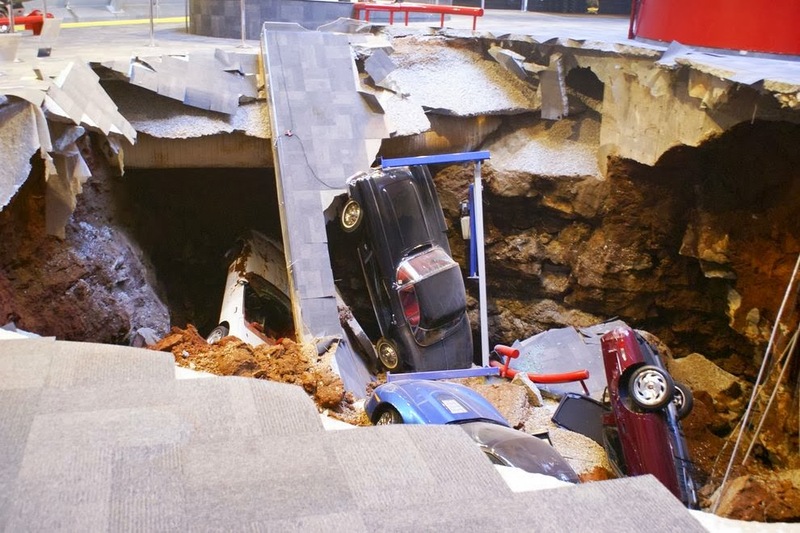 "Early Wednesday morning a sinkhole opened beneath the National Corvette Museum in Bowling Green, Kentucky. No one was injured, but the 40-foot-wide (12-meter-wide), 25-foot-deep (7.5-meter-deep) fissure swallowed eight valuable sports cars shortly after 5:30 a.m."
They intimated that the incident was really only a matter of time until something like this occurred. In addition to being atop a porous area, "Caves are a common feature in this part of the state," he says. And we usually see sinkholes here after a hard rain. But as far as I can tell, what happened in this case was that drainage water has been coming off the museum building improperly for some time. And it focused and built up at one point on the soil." Sinkholes and earthquakes seem to shake people up more than just about anything, no pun intended. It is more than disconcerting to have walked on what feels like solid ground under your feet all your life only to feel it swaying, shaking, and even turning to liquid. Even worse is seeing that the very ground user us can open up all of a sudden and swallow us. Scarier still is when it happens inside a building. We think buildings are sturdy and can protect us, but we are sooo vulnerable on this earth it isn't even funny. It was heartbreaking to see such beautiful classic cars tumble into the earth, but it's so terrible when it happens to a person. Remember a year ago in March 2013 when a sinkhole suddenly opened up under a sleeping family, swallowing a man as he slept in his bedroom? But Christ challenged the people's notion that they were morally superior to those who suffered in such catastrophes. "A loud crash, then nothing: Sinkhole swallows Florida man"
"The ground just swallowed him up. A Florida man fell into a sinkhole that opened suddenly Thursday night beneath the bedroom of his suburban Tampa home, calling out to his brother for help as he fell, the brother said Friday." In Numbers 26:10 those who had contended against Moses and Aaron were gathered and the LORD made the earth open and swallow them. "and the earth opened its mouth and swallowed them up together with Korah, when that company died, when the fire devoured 250 men, and they became a warning." They became a warning, in other translations, a sign. Pulpit Commentary says, "something made conspicuous in order to attract attention and enforce a warning"
God has, when he pleases, strange punishments for the workers of iniquity. It was very significant. Considering how the earth is still in like manner loaded with the weight of man's sins, we have reason to wonder that it does not now sink under its load. The ruin of others should be our warning. Could we, by faith, hear the outcries of those that are gone down to the bottomless pit, we should give more diligence than we do to escape for our lives, lest we also come into their condemnation. …"So all these curses shall come on you and pursue you and overtake you until you are destroyed, because you would not obey the LORD your God by keeping His commandments and His statutes which He commanded you. "They shall become a sign and a wonder on you and your descendants forever. "Because you did not serve the LORD your God with joy and a glad heart, for the abundance of all things;"
He smote the priests offering strange fire (Leviticus 10:1). Also read Ezekiel 5:15 where the LORD says He will punish Israel as an example, or, 2 Peter 2:6, where the destruction of Sodom Gomorrah (and Admah and Zeobiim) were an example to the ungodly. On the other hand, we can't presume that this incident or that incident is an example of the Lord's displeasure. Sometimes things happen. The Tower of Siloam is a good example. When the Pharisees questioned the Lord Jesus, an incident had obviously occurred which were still on the minds of the people. They were still talking about it. A tower had fallen on people and killed 18 of them. Here is the verse and Matthew Henry's wise commentary, which we should take to heart regarding sinkholes, volcanoes, earthquakes, or any other sudden disaster or destruction. Ultimately, since everything is under God's control, He causes or allows it all to happen so that His plan will be executed, everything is a warning. John MacArthur's commentary explains, It was the belief of many that disaster and sudden death always signified divine displeasure over particular sins (cf. Job 4:7); [and Numbers 16:30 as above]. Those who suffered in uncommon ways were therefore assumed to be guilty of some more severe immorality. Jesus did not deny the connection between catastrophe and human evil, for all such afflictions ultimately stem from the curse of humanity's fallenness. (Gen 3:17-19). Furthermore, specific calamities may indeed the the fruit of certain iniquities (Proverbs 24:16). But Christ challenged the people's notion that they were morally superior to those who suffered in such catastrophes. He called all to repent, for all were in danger of sudden destruction. No one is guaranteed a time to prepare for death, so now is the time for repentance for all (cf. 2 Cor 6:2). We live on borrowed time, a sinful earth, and no tomorrow is guaranteed. The answer to the events happening, including the earthquake last night, is...repent. I would like to add another event to your list http://www.youtube.com/watch?v=wsXlUbw3El0 what are your thoughts about these noises that are happening? "A noise shall come even to the ends of the earth; for the LORD hath a controversy with the nations, he will plead with all flesh; he will give them that are wicked to the sword, saith the LORD." (Jeremiah 25:31). The Hebrew word for noise is defined in Strong's Concordance: "shaon: or din, clamor, big noise, roaring, rumbling, tumult." Jer 25:31 is a tribulation/last days verse. The sounds people have been hearing all over the world have been variously described with exactly those adjectives. In no case have they been described as a pleasant noise. In most cases they're described as weird, scary, or unsettling. in one or two cases there had been proved to be a normal cause. In most cases, no normal cause has been put forth. I wondered in the essay if we were to hear leak-through from the demon-angel armies, if that would be what it would sound like. Or maybe it is demonic horde trying to scare us. In another possibility perhaps it has a normal cause we just have not heard of yet. Dunno!